I have a new Anubias nana secured lightly to driftwood that soon developed a mushy grey rotting end that lost most of it's leaves. I cut that piece off and dripped hydrogen peroxide on the whole of it. That was 2 days ago and I hope that ended the problem, though I've read that it can spread. There is another Anubias nana with no problems and several months older. It is a low light 20 gallon tank with a good flow and filtration. The testing for ammonia, nitrates and nitrates is always in safe levels, 0 in all. I do a 40% water change once a week. The tank is not over stocked. What might you think of this? 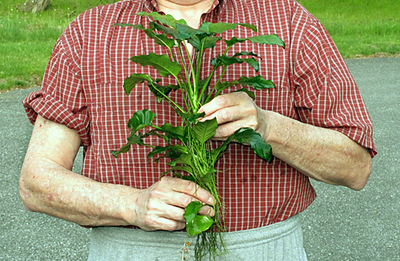 It could be that your Anubias nana was not healthy when you bought it. "Safe" tells us nothing about your water parameters. A reading for nitrates of 0 is almost impossible unless the tank has just been set up, or the tank is so overplanted that the plants are using up the nitrates. Not likely. If you are using test strips, they are extremely inaccurate. You would need liquid reagents like the API Master Test Kit. What is the stocking of your tank and how large is it? We need exact numbers and species. I was afraid of the chemistry questions, with my "0" nitrates statement. Yes, using an API kit with yest strips. The tank is 24"X12"X16". It was sold long ago as an Aqueon kit with hood and 15 watt 18" t8 light. The substrate is med. to courser gravel, bought I believe with the tank. So, rooted plants are out. It is unheated, but the extremes daily are little, and seasonally from 68F to 70f in winter to the mid 70'sF to 80F summer. Subtropical as were, as another tank I own with similar plants. Here the fish are a very healthy small shoal of 7 white clouds, 5 bloodfin tetras, and 4 black skirt tetras. The ph is above 7.8 and all I know is that our water is on the hard side, this is what is common knowledge and the streaks left on glass I believe mean the same. My best success in this tank, and the smaller 15 gallon, is with java fern, pennywort is a plant neither growing much or dying. 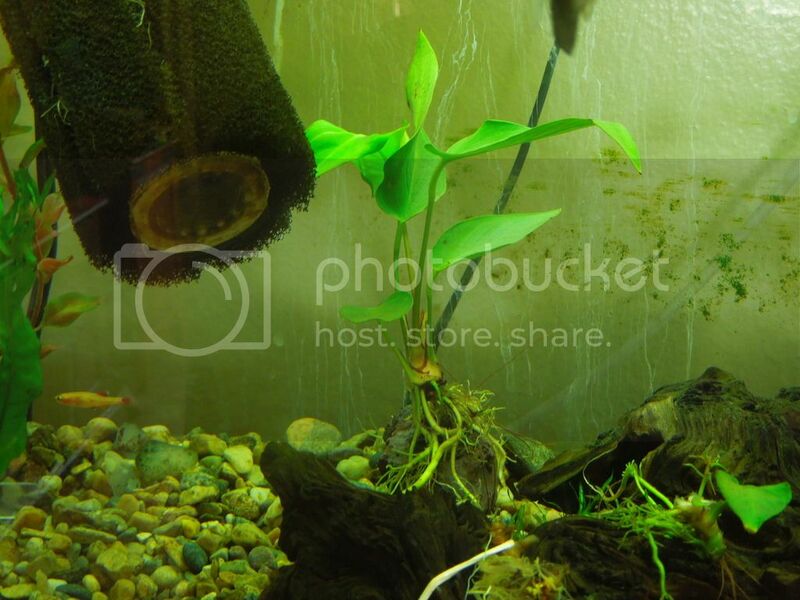 A top fin anubias nana attached to a ceramic bridge is the one doing well, and one bought in a tube as anubias sp. tied to a cinder rock is doing fine so far. The light, that single tube, is on 12 hours a day. This is not very technical information but it is what I have. I bought this plant from a noted sales place and he used a dirted substrate with the rhizome above it of course. Hope this helps, and thanks for your reply. Sometime they do that. As long as the problem ended there, I would not worry about it especially since the other anubias is fine. The problem may have been caused before you got it. Just keep an eye on things to be sure is was a freak occurrence rather than an ongoing problem. I have never had one completely rot. 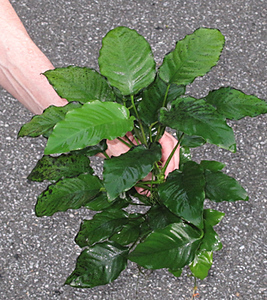 Ive seen this with some of my Anubias...Its harmless...Just be sure to cut of the rotting part...The plant should survive once there is some small section of rhizome left! As you can tell I am not as well versed in all the water particulars as most of you. Still, I do my best to maintain my system with what I own. That particular plant has a small new leaf at the cut, got my fingers crossed. Anubias are notoriously slow growers when submerged. They are not a true aquatic plant. in the wild they grow on rocky outcrops etc. very close to waterfalls and rapids which make a lot of spray. While they need a lot of moisture, they do not need to be submerged. When they are, they do not seem to mind, but the tend to grow slower that way. This is why they are often the first ones in a planted tank to get algae on their leaves. One of the best signs of the condition of any plant is new growth. If it is producing new growth whuch does not fail, the plant is usually fine. I knew that of Anubias but don't have your experience with plants. Slow growing is the word with these guys (in my tanks.) My best success with the stock tank/lights I have in either tank has been with Java fern, new growth is relatively fast. In my 15 long which gets direct sunlight several hours a day, what squeaks past card board backing, I've a fern with many "fernlets" growing off the larger plant. I imagine they'll separate on their own, one has I noted while doing a water change. I love anubias, perhaps they'll take off suddenly. That is an awesome plant! I hope that with my tank's water and light parameters that one day I'll have something like that, though I doubt it. Wow, that's much bigger than mine. Great stuff. Since I made this post so long ago I have many more plants, in more tanks as well. In the tank in question, with a plant that had the rot, I have new leaves on all 6 plants there at this time, they are nice, but not as that picture above by any means. The plant that suffered is still the smallest but went from one tiny surviving leaf to now 6 and it's growing. Since then also I've seen all anubias tanks done very nicely.